We have the widest range of specialist + DIY products in the area, plus most other products available on a 2 - 4 day delivery, including wallpapers. 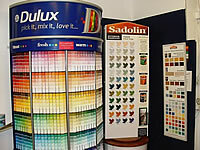 Over 6000 paint colours available from stock. Sadolin & Sikkens woodstains, Zinsser coatings, Dulux paints & stains, ALBI Fire Resistant coatings, Akzo coatings, Crown paints, Galvafroid, Teamac marine coatings, harlequin wallcoverings + many more.